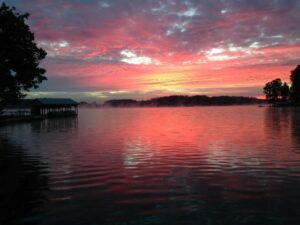 Jackson Lake is a wonderful, moderately sized lake located only one hour from the heart of Atlanta. It features a tight knit community, anchored by the Jackson Lake Homeowner’s Association (JLHA). This group meets four times a year, and their main goals include promoting fellowship, education, communication and improving the quality of life at Jackson Lake. A clean lake is without a doubt the most enjoyable lake. Volunteer your time to make Jackson Lake looks its best year round. In addition to cleaning up the lake and meeting all your neighbors, you will also be treated to a free lunch! Cleanups start at Lloyd Shoals Dam on the dates listed above, all starting at 8:30 a.m.
Don’t forget to bring a pair of boots and some work gloves! Just as the title suggests – bring anything that you can paddle! That includes kayaks, canoes, and paddle boards. Make your pickup reservations by emailing JLHAReservations@gmail.com. Poker runs are fairly common across the south, particularly during the summer months when everyone is out boating in full force. It involves traveling by boat to each of the 5 sponsor’s docks, picking up a playing card, then finishing up at Reasor’s Landing. At this point you have a “poker hand” and the boat with the best hand wins! The cost to participate will be $25 per hand, and proceeds will be used to promote boating safety and the use of a designated skipper around Jackson Lake. For more information contact michelle_turgeon@yahoo.com. These are just a few of the events taking place across Jackson Lake this upcoming spring and summer. For more information about other exciting events, such as the July 4th Boat Parade, feel free to reach out to Wally Cawthon. Wally is the local lake expert and the number one real estate agent on the lake! See Wally’s profile on LakeHomes.com and visit his website for more details.